Asarum or ‘Wild Ginger’ are a native of North America, Europe China and Japan and are often referred to as ‘Wild Ginger’, however these plants are not edible. Asarum are grown for their foliage which can be most attractive. Asarum maximum is probably the most sought after species. Asarum are mainly grown as a ground cover, however some species such as Asarum maximum also have most interesting flowers. A. maximum has black and white flowers which form below the foliage, often referred to as ‘green panda’ or ‘panda faced ginger’ this Asarum looks great in a pot in a slightly raised position which helps bring the flowers into view. A. asperum is known as Japanese Wild Ginger. Asarum caudatum is known as Western Wild Ginger. Asarum delavayi is known as Chinese Giant Wild Ginger and with its glossy leaves is a showy ground cover. Look for Asarum epigynum, Asarum europaeum, Asarum hirsutasepalum which is an evergreen species, and the vigorous Asarum splendens. Asarum are really a woodland plant and grow well in a humus rich soil in a shaded position. Asarum europaeum has mid green kidney shaped (reniform) foliage, a low growing species it will reach nearly .1m and is also known as European wild ginger, Hazelwort and Asarabacca especially in the homeopathy world. The species is variable some with attractive slightly marbles foliage, others a plain green. Evergreen and hardy it makes an excellent ground cover for a shady position. Although they will flower the flowers themselves are often held beneath the foliage and are often missed al together, the flowers do not has a particularly attractive fragrance. Asarum canadense is a woodland plant, another low growing species to .1m, also known as ‘snakeroot’ and Canadian Wild Ginger. This is a deciduous species that has heart shaped foliage. Leaves are a mid green and covered with fine hairs which give them a velvety texture. The roots (underground rhizomes) are fleshy and spread slowly to create a carpet in a woodland area. Like many Asarum species flowers of Asarum canadense are held under the foliage and are not generally a feature, this is used as a ground cover plant, low maintenance and tolerant of damp areas. Best suited to part shade to full shade. Asarum maximum is a taller growing species best known for the cultivars Asarum maximum ‘Green Panda’ and’Ling Ling’ Reaching around .5m in good conditions the large leathery foliage make a it great ground cover plant. The cultivar ‘Green Panda’ has large flowers a deep purple to black with a white eye, and they look very attractive, however they are again often help under the foliage. Try growing this one in a pot or container, where it can be ‘lifted’ up from ground level and the flowers can be more accessible. The foliage is heart shaped and marbled, easy to grow and a good indoor plant as well as great addition to the woodland. The species can be grown from seed, division is also a good propagation method. Asarum Delavayi ‘Sichuan Splendour’ with it’s trademark glossy green ‘arrow shaped leaves’ is a wonderful foliage plant. Flowering is late winter to early spring with small purple flowers flecked with yellow this is an evergreen species. From China. Propagation is from seeds or division, like most asarums A.Delavayi grows well in a shaded position in a moist woodland area. Also excellent in a container. All Asarums require a shaded position ‘dappled shade’ and a humus rich moist soil. They grow well in containers and make an excellent groundcover plant. 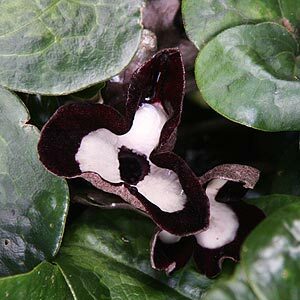 Asarum maximum (pictured below) has attractive flowers as well, however these are generally held beneath the foliage. The only real problems are slugs and snails, which is why many collectors will grow Asarum in containers in a shaded position. Some copper tape around the container will deter slugs and help keep the foliage in good condition. In the garden try using wood ash, diatomaceous earth or sawdust to deter slugs.